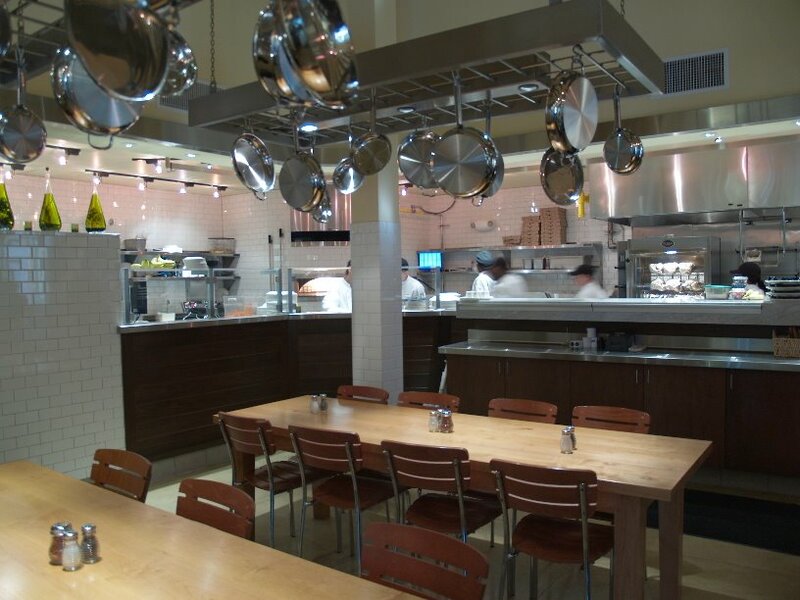 I completed the redesign and expansion of the Wolfgang Puck Express restaurant in Orlando Florida. A new dining room structure was added to the building and the existing space was remodeled for better customer flow and visual appeal. The restaurant now has double the previous seating capacity. The restaurant’s contemporary design features the brand’s deep chocolate brown and accent green colors, sumptuous leather booths and banquettes, light wood table tops, and two family-style tables. Other design features include black and white photos of Chef Puck and fresh ingredients that are commonplace in the kitchen. Floor-to-ceiling glass doors offer a complete view of the bustling dining room from the new and expanded patio with brick columns and awnings. I was pleased to create an open and inviting atmosphere for the restaurant by fashioning the existing space as a large eat-in kitchen with community tables and hanging pot racks, and adding a new vaulted-ceiling dining room for more seating.